Cultivation of the land in the Taipei Basin began with the immigration of the Han at the end of the seventeenth century and gradually extended to various locations along the northern coast. In the 1770s people that had immigrated from Zhangzhou in modern-day Fujian Province, including the famous merchant Wu Sha, appeared in Sandiaoshe (Shuangxi and Gongliao townships in modern-day Taipei County). The Lin Shuangwen Incident took place in 1786, when the Taiwanese governor Yang Tingli got news of rebels fleeing to Sandiao and E-A-Lan (Yilan) and requested his counterpart in Danshui, Xu Menglin, to hurry to Sandiao and cut them off. In his reply to the governor, Xu Menglin mentioned that Wu Sha had long resided in Sandiao and that because Wu Sha was trusted by the people he could be of value in reining in the rebels. Wu Sha was later referred to as the pioneer in opening the way to the Lanyang Plain, and this was his earliest appearance in historical records. From 1787, investors from northern Taiwan that were interested in Yilan lead a number of capitalist ventures there but were all unsuccessful. Wu Sha was therefore commissioned to organize a trail-blazing team to cultivate the Lanyang Plain. Until 1797, Pingpu tribes in Yilan were stricken by an epidemic, and it is held that Wu Sha cured the people with medicine. An improvement in relations with the various settlements was thus possible, and the Han were allowed to enter Yilan to establish their first foothold: Toucheng. News spread that Wu Sha had opened a path to the Lanyang Plain. Han from everywhere subsequently came to seek opportunity, and these people organized the "Leader of Nine Flags". Although they still view the Wu family as their leader, in reality, many rose up to the ranks of leadership concomitantly. In 1804, the Han expanded their territory to Wuwei (modern day Yilan City). In 1806, the Pingpu tribe and various Alishi groups who came to the outskirts of Wuwei from western Taiwan were attacked by the Han. They had no choice but to turn south of the Zhuoshui River (modern-day Lanyang River) in order to ensure their survival. Incidentally, they became the pioneers of the Luodong area. 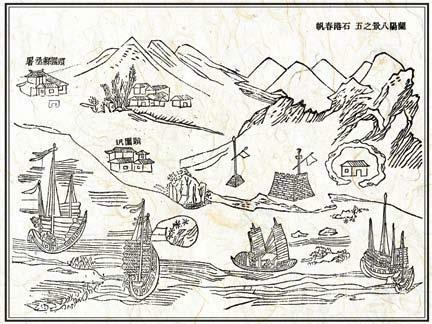 In 1810, when Yang Tingli was organizing affairs pertaining to the development of Yilan, his records show that Yilan had a population of 14,452 households and 42,904 persons which included 38 Kavalan settlements comprising 5,540 persons. The Han, in the process of expanding their territory on the Lanyang Plain, owe their strength to a system called "leading knots", which entailed organizing 30 to 50 farmers into a "knot"; the "knot leader" would lead the process of cultivating and farming the land. The land would be divided into sections, and one section would be allotted to each member of the group. Other than the "minor knot leaders", there were also "major knot leaders", the "general knot leader" and the land capitalist. The "minor knot leaders" were responsible for regions dubbed "knots", and "major knot leaders" were responsible for regions dubbed wei. This system of farming the land is different from the methods used by the Han in western Taiwan, and the potential rewards encouraged participation by individuals out of free will. Before the Qing Dynasty established a Kavalan subprefecture in the government, the immigration and development of Yilan by the Han in the period from the Wu Sha era to 1809 were in violation of an edict that banned such activities from crossing borders. But what was done was done, and Han communities claimed over half of the Lanyang Plain. Pioneering leaders who wanted to safeguard their ownership of the land and local officials with foresight who wanted to maintain public order suggested the emperor’s advisors to establish official rule in the Yilan district. However, Qing Dynasty rulers showed little interest in governing Taiwan and ignored the problem.